Leaks exposed by this week’s heavy rain is evidence that Dunvegan Primary on Skye is now at ‘crisis point’, the chairman of the school’s parent council has warned. 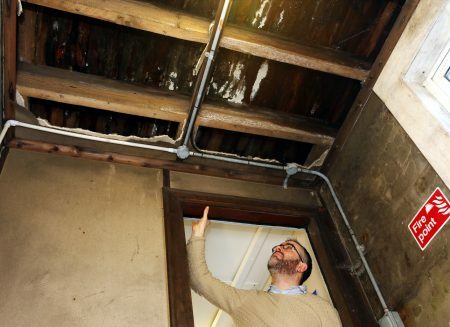 Elgar Finlay circulated a video on social media this week which showed water pouring through the walls and into the basement directly below a classroom. The incident prompted the parent to write to Scottish education secretary John Swinney and Highland Council leader Margaret Davidson urging action. By yesterday (Wednesday) Mr Finlay said the situation had worsened, adding that he had also been refused access to have a look at the affected areas. He said a dehumidifier placed in a classroom did not work, and that water was being pumped out of the school and back into a drain, so was likely to seep back into the walls that had been leaking. Some parents also raised concern that a tanker arrived during the children’s break time to remove raw sewage. The parent council have taken water samples for testing, Mr Finlay added, as there were concerns that raw sewage could mix with flood water in the school playground. 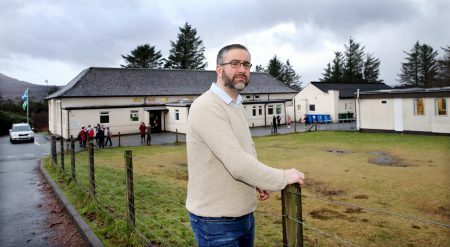 Parents were recently told that it was unlikely a new school build for Dunvegan would be considered before 2021, and their best hope for improvements could be a package of measures to refurbish existing facilities. Mr Finlay said: “It is only a matter of time before this school causes serious health issues for our children. I have no idea if the structure of these walls remains safe or if the school could collapse. Parents and the wider community are justifiably enraged to see this type of footage. “Our community is rightly becoming more angry, each week that passes as there is another significant issue being reported. Following Tuesday’s complaint a Highland Council statement said: “Urgent repairs are being made to the Dunvegan Primary School. Following on from heavy rainfall, groundwater is entering a disused basement plant room at the school. “The local maintenance team is organising for the water to be pumped out of the basement and the area will then dried out. Surrounding land drainage will be checked and repaired if found necessary. Chair of the council’s care and learning and housing committee Andrew Baxter said: “We’ve put a very strong case to the Scottish Government as to why the Highlands should be treated differently when it comes to funding for our schools. “This is because of our high number of small schools, many in remote areas, that cost the council much more to maintain compared to elsewhere in Scotland. Leader of the Highland Council Margaret Davidson thanked the local team for their quick actions to address the problem at Dunvegan. MSP Kate Forbes said: “This is an exceedingly concerning situation that must be resolved as a matter of urgency. It is the latest evidence that parents and pupils deserve a brand new school. “I will raise the matter with Highland Council, as they are responsible for the school estate. Dunvegan Primary needs to be on the Highland Council’s list of priority schools for the sake of the children. Earlier this year a £10 million proposal to build a new primary in Dunvegan was among several projects shelved by the council due to budget pressures which cut their previous capital spending ambitions in half. Four years ago the local authority had proposed to create a new facility in Dunvegan that would serve the bulk of north west Skye. However, that idea was scrapped after a related plan to close three small north Skye primary schools was eventually thrown out following a lengthy battle which ended with a ruling at Portree Sheriff Court in February 2016.